David Vollbracht, artist of our current exhibit, Recollections of Nature, is well known for painting beautiful landscapes. In fact, David is highly regarded as a representational painter of the West. Some of David’s favorite subjects are the Kansas prairie and Rocky Mountains. Have you ever considered how much of a prairie scene is actually comprised of sky? At the risk of sounding dense, I must admit that I personally had not. 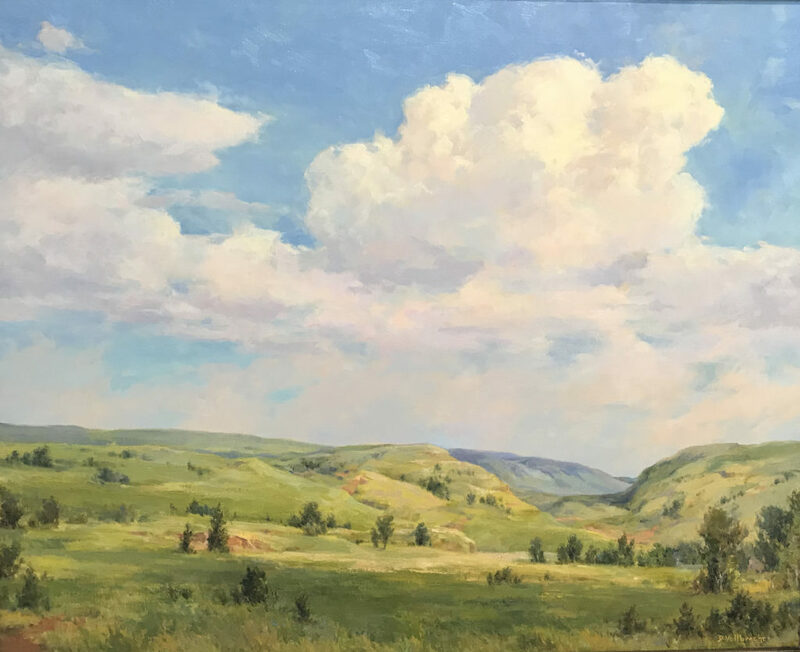 Being a prairie native, I have enjoyed beautiful sky scenes throughout my life, but truthfully, I had never fully appreciated our unobstructed firmament view until seeing it prominently depicted in David’s paintings. At times, vastness overwhelms, but the opposite is conveyed through David’s rendition of the endless prairie sky. Peace and serenity are effortlessly translated along with the feeling of encouragement in David’s rendition of the prairie sky. Looking at how truly endless the sky appears, one can harmoniously be lulled into feeling the same; finding inspiration to try harder and reach farther without the accompanying anxiety that usually comes with tackling new challenges. Dennies Andersen and Elizabeth Doxon, creators of Tech-Tok, are July’s Artists of the Month, these two have inventively found new life for dead computer parts. True recyclers, they have repurposed computer components into working clocks…thus the name Tech-Tok. Unusual, but super cool these clocks truly are unique and would make a perfect gift for the techy people in your life. As always, Museum members receive a 5% discount on all Artists of the Month purchases. The Dane G. Hansen Plaza is proud to host StoryWalk®, a fun interactive way for children and adults to enjoy reading and the outdoors at the same time. Laminated pages from a children’s book attached to stakes installed along the Plaza’s sidewalk guide readers page-by-page through the whole book. Best of all, at the end of the book you get a ticket for a free book! Bring the ticket into the Museum or the Logan Library to receive your book (one per family) while supplies last. The StoryWalk® book currently stationed around the Plaza is Mercer Mayer’s, “A Green, Green Garden”. 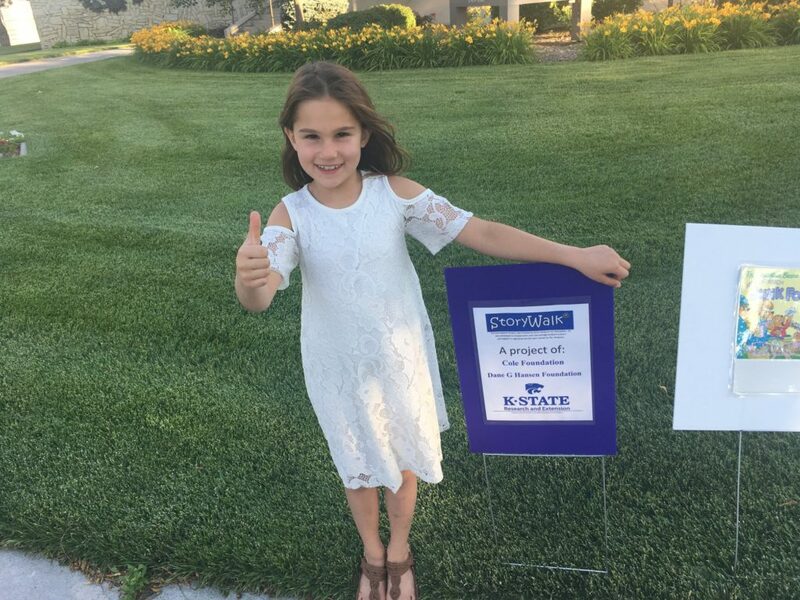 Thank you, K-State Research & Extension and the Cole Foundation for sponsoring this project and to the Dane G. Hansen Foundation for providing the free books. Great art and an awesome story, definitely a great way to fill part of your day. Come on out to the Museum, we have something for the whole family to enjoy. The Museum is located at 110 W. Main Street, Logan, Kansas. Museum hours are Monday through Friday 9-12 & 1-4; Saturday 9-12 & 1-5; Sunday & holidays 1-5. We are handicapped accessible and thanks to the generosity of the Dane G. Hansen Foundation, there is never an admission fee. For more information, please call 785-689-4846. We hope to see you at the Museum!